After many moons of trying to stuff my feet into shoes and boots that pinched, it finally dawned on me that my shoe size might have changed. Apparently this can happen as you age and the arches and pads of your feet “settle.” Who knew? Sure enough, I’ve steadily gone from a 5 to 5.5 to 6 to 6.5 over the course of my adult life. Now, I’m solidly a 7! So, I’ve been slowly replacing some essentials– work shoes, flats, barn boots… and thought I’d take advantage of the end of season sales to get some pac boots. I totally scored when I found this pair of Khombu Arctic 2 Boots. They are rated for -20, completely waterproof, and cute to boot! (pun intended). And just when I was thinking I’d have to wait until next year to really give them a work out, winter still seems to have plenty of snow in store for us. 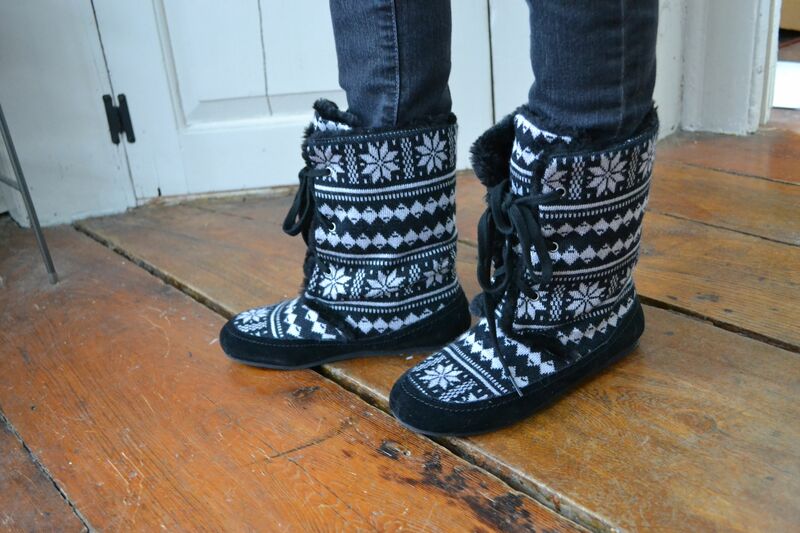 While I was at it, I also picked up a pair of these awesome Lucky Brand Fair Isle Slippers to keep me warm. My “Lucky” slippers– ha ha. I have a feeling I’ll still be getting plenty of use out of both!